In Friday's post I mentioned that I'm getting the patio all ready for Summer. I've been thinking about adding one more seating area, and yesterday ordered 2 chaise lounges to put in the front corner of the patio that is not covered. Many times on cooler days it's nice to sit in the warmth of the sun, but I plan to use my black and white striped patio umbrella between the two chairs if we'd like to add some shade during the hot Summer months. We've had the hanging chair in that spot off and on but it's really better out of the sun and I think the chaises will be more comfortable and accommodating. *This post contains affiliate links, which means I may make a small commission at no extra cost to you. Read my full disclosure policy here. 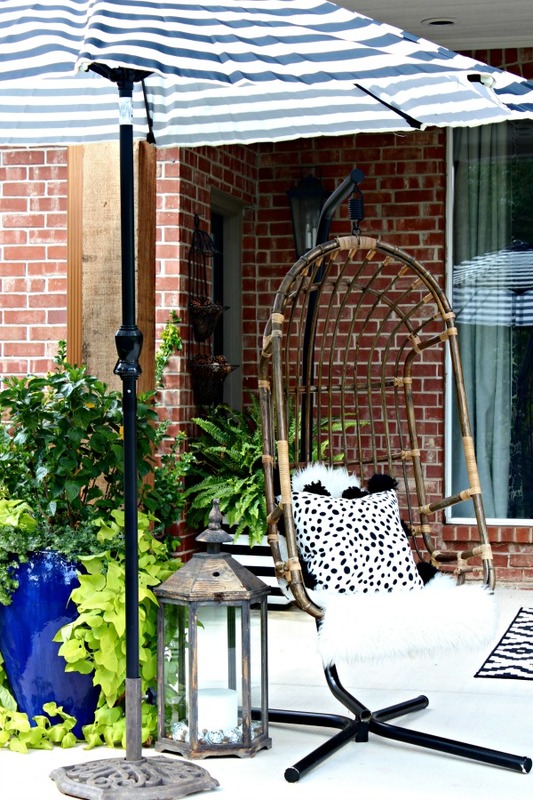 I've noticed so many fun new styles of patio umbrellas lately, not just the usual solid colored market style. They are a great way to add a pop of color and/or pattern to your outdoor space. I'm especially drawn to the ones with fun details like scalloped edges, fringe trim, a vintage feel, and interesting shapes or patterns. Here are a few of the cutest that I found online, mostly 9' in diameter and around the $100 price point (some a little more, some much less). Many are available in different colors with options shown once you click on the page. Simply click any photo that you'd like to see more details on! And if you're wondering, these are the chaise loungers that I ordered. I adore the cane wicker detail which says "weather resistant" but am anxious to see if I think it will withstand the elements well. The chairs did have mixed reviews regarding assembly, so I guess I'm a risk taker! With free returns to the store available though I thought I'd take a chance. I'll give you an update when they arrive.